You can add “being distraught over the death of your child while black” to the growing list of things that might get you arrested after police locked up a grieving mother for trying to see her son at a Pennsylvania hospital. 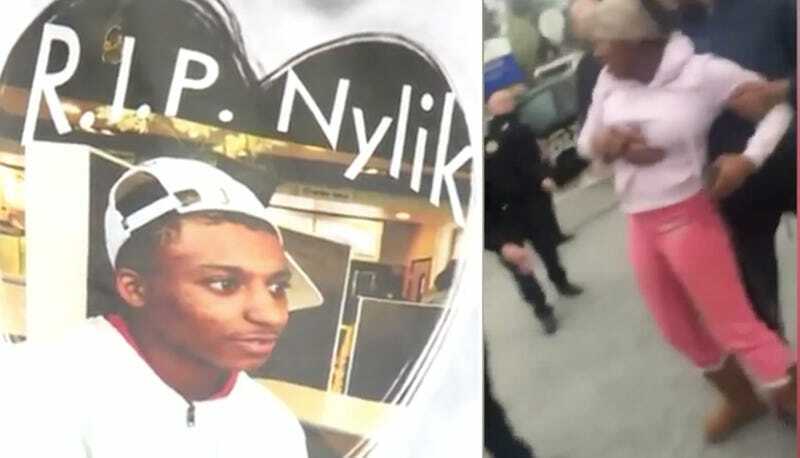 According to the York Daily Record, on Tuesday, after Cheirha Rankins arrived home from visiting her grandmother’s grave, she received a phone call that her son, Nylik Moore, had been shot. She rushed to York Hospital a few blocks away in York, Pa., unaware that her son had already been pronounced dead. When Rankins arrived, she attempted to enter the emergency room but was told that the hospital was on lockdown. She pleaded with employees to let her in, believing that her voice could help save her 18-year-old son’s life, but they refused. Her family arrived and began crying, praying and begging police officers to allow the mother to see her dying child. Inside, a deputy coroner was examining the body and preserving evidence. Upon completing the examination, the deputy coroner wanted to allow Moore’s family to view the body, saying that it was an important part of the grieving process. But the deputy coroner’s request was denied. Instead, officials told the deputy to tell Moore’s family that he was dead and that they’d have to view the body another time. Obviously upset, Rankins demanded that she be allowed entry, and the police refused her. Rankins then said that she was trying to help her mother, who suffers from a respiratory illness and uses a walker, when police arrested her. Moore’s sister captured the incident on video. Rankins was handcuffed, taken to central booking, issued a citation for disorderly conduct and later released. Three days later, she still hadn’t viewed the body of her son. York Mayor Michael Helfrich said that he is investigating the incident, meeting with hospital personnel and York City Police Department officials. We have talked to the family to offer our condolences and to sincerely apologize for what occurred Tuesday night. Unfortunately, we did not have a well-established process in place to ensure family access to their loved one during such a complex situation. We have begun working to develop a process for these situations, and we have already had discussions with the coroner, the Mayor`s Office and the York City Police Department. The York Daily Record reports that the victim was targeted by the shooter. Police have made no arrests but say they are looking to question a man named Shanquay Ritter about the incident.